It's fitting that it's a German company bringing the spirit of Faszination (YouTube it) to PC racing enthusiasts. 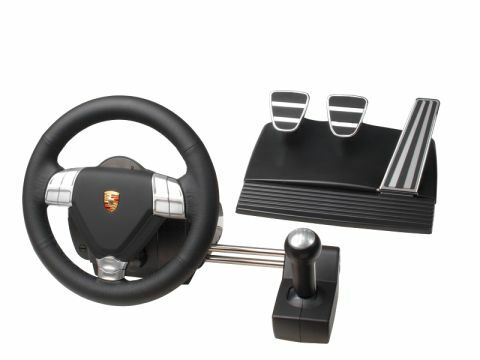 Fanatec's new wheel is an impressive replica of the cockpit of a modern Porsche 911. The hoop itself is a chunky, sturdy affair and boasts several interesting features that mark it out. For a start, single power cable aside, the wheel and pedals are completely wireless, communicating via an ignition key dongle. This means if you haven't got a permanent cockpit setup, it's quick to swap the wheel from your desk to the floor, appeasing disapproving significant others. There's also the option to run power to the pedals, should your four AAs run out of juice. The inclusion of vibration, in addition to two force feedback motors, adds a nice layered and detailed effect to the overall feedback and the 900-degree wheel is precise and lag free. On the downside, the pedals feel flimsy and plasticky compared to the weighty booters on Logitech's G25. The six-speed shifter is a welcome addition, but it's so stiff that you'll have an arm like Popeye after your first flying lap. The major case of sugar in this porker's petrol tank, though, is the price. It's a clear £70 more expensive than the superior G25, which is presumably down to the badge stamped on its centre. It's the only wheel to get anywhere close to Logi's incredible setup, though, so a couple of refinements and a price drop and the race is on.